It has been a very busy end of term in the Senior School. The girls have returned to classes after Test Block and have been receiving their results and valuable feedback. Please encourage your daughter to discuss with you not only her grades, but also the advice that her teachers have given to her to help her improve. The feedback is constructive and useful for the girls as they set their goals for the rest of the year. For a number of Year 11 students, conversations have been held about them changing their subjects. The window for this to occur closes this Thursday. The Year 10s have been completing their Career Pathway Plans to assist them in choosing their subjects for Year 11. It was good to see so many parents at the Information Evening on the Queensland’s New System of Senior Assessment and Tertiary Entrance. While there are a number of changes coming, we are very well placed to implement them. Meditation – find some place for calm each day. Exercise – get your heart rate up a few times a week. Diet – use your pantry to increase your health. Sleep – one of the most powerful ways to reduce stress and depression, increase memory and learning, build energy, slow ageing and lose weight is to sleep well. Having connections is also an important factor, as well as knowing yourself and having quality relationships. He talks about the five values that feature in quality relationships: Trust, Forgiveness, Integrity, Hope and Compassion. Interestingly, three of these form part of the Schools’ core values. Holidays are a good time to reflect and re-evaluate how your daughter is travelling and discuss with her how she can increase her resilience. 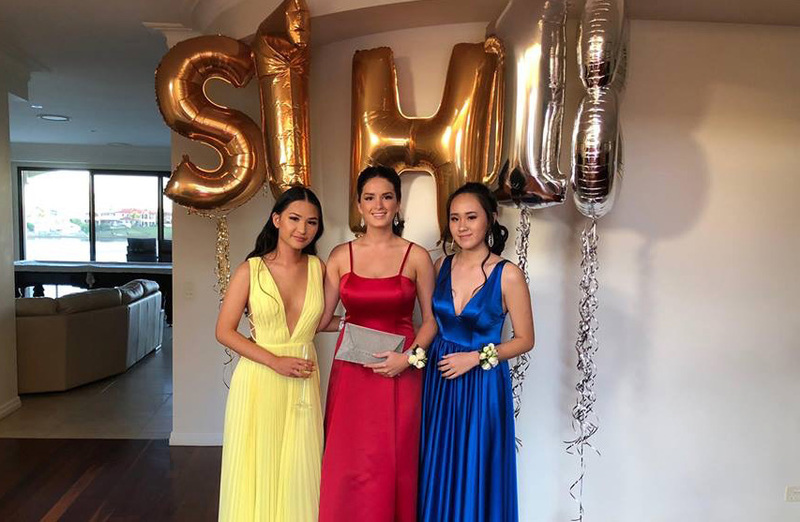 The Year 12 Formal was held last Saturday at Bond University. Although it was a cool evening the atmosphere was wonderful. The girls all looked elegant as they walked the red carpet. They enjoyed dancing their way through the evening. It was lovely to finish the evening with a full dance floor of staff and students trying to do the Macarena! My thanks to Mrs Majda Benzenati and Miss Lauren Hall for all their work in ensuring the evening was a success. A number of School shoes are looking a little neglected, these should be polished. Your daughter should have a hat, the felt one for Terms 2 & 3. Blazers are the outer wear in cooler weather; jumpers may be worn underneath. Jumpers cannot be worn as the outer garment when arriving or leaving the school grounds. Black tights can be worn with the uniform in winter. Thank you for your ongoing support of school expectations. Year 10 Students will have their Career Pathway Plan interview in the first week of next term to assist in the choosing of subjects for Years 11 & 12. Parents are reminded to log onto TryBooking via the link provided below to book a time if they haven’t already done so. Please be reminded that Semester 1 Reports will be available on Parent Lounge during the first week of the holidays. Parents are encouraged to print a copy for their records. I hope that you and your daughter have an enjoyable, relaxing and safe holiday.